Super Awesome Sylvia speaks at CMK 2012! 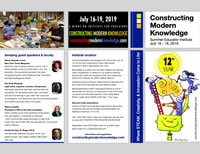 Educators who attended Constructing Modern Knowledge 2012 got to spend four days with Super Awesome Sylvia. Below is video of her super awesome 2012 TEDx Redmond Talk.